Updated at 12:15 p.m. EDT (1615 GMT). Rain showers and gloomy clouds blew through NASA’s Kennedy Space Center on Monday evening, but it was high winds that prevented liftoff of a SpaceX Falcon 9 rocket early Tuesday with a commercial communications satellite. The next launch attempt will come Thursday at 1:35 a.m. EDT (0535 GMT), SpaceX confirmed in a tweet later Tuesday. 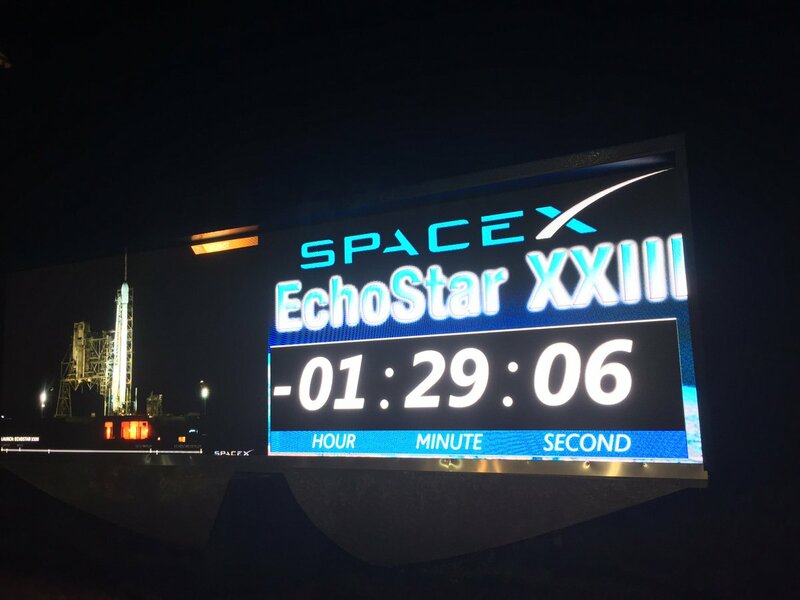 SpaceX’s launch conductor declared a scrub less than 40 minutes before Tuesday’s scheduled launch time of 1:34 a.m. EDT (0534 GMT), and the countdown clock halted at T-minus 38 minutes, 55 seconds, just after super-chilled liquid oxygen propellant started pumping aboard the two-stage Falcon 9 rocket at launch pad 39A. Officials said high winds were to blame for the scrub, without citing whether the unacceptable winds were at the surface or in the upper atmosphere. The launch team tracked concerning ground-level and high-level winds during the countdown. 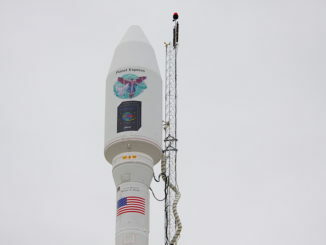 Engineers drained propellants from the rocket and safed the vehicle and the EchoStar 23 communications satellite mounted on top after the scrub and began preparing for another launch opportunity later this week. 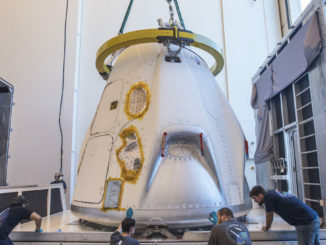 Going into Monday night’s countdown, SpaceX had a backup launch window reserved with the U.S. Air Force’s Eastern Range, which runs tracking and safety infrastructure at the Cape Canaveral spaceport. In the aftermath of the scrub early Tuesday, SpaceX could not confirm whether the launch could go ahead Thursday, or perhaps another day this week, but the company later tweeted the next try would come Thursday. The Air Force team responsible for issuing official launch forecasts released an updated outlook predicting weather conditions for a launch attempt Thursday. The forecast calls for mostly clear skies, scattered high-level clouds at 25,000 feet, north winds of 15 to 20 mph, and a temperature at launch time of 53 degrees Fahrenheit. There is a 90 percent chance of acceptable weather during Thursday’s two-and-a-half hour launch window, the Air Force weather team said, after the cold front responsible for the inclement weather pushes through the area. Upper level winds will still be strong Thursday, but slightly weaker than the high-level winds predicted for Tuesday’s launch window. 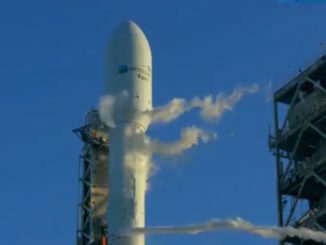 SpaceX is readying for the 31st launch of a Falcon 9 rocket since June 2010, and the third Falcon 9 mission this year. The EchoStar 23 satellite is stowed inside the Falcon 9’s nose fairing to begin a 15-year television broadcast mission over Brazil. EchoStar Satellite Services, a Colorado-based company, owns the spacecraft. Space Systems/Loral manufactured the EchoStar 23 satellite, which was originally supposed to launch by the end of 2016. Launch delays triggered by a SpaceX rocket explosion on a nearby Cape Canaveral launch pad in September slipped EchoStar 23’s launch into early 2017. EchoStar 23 weighs around 12,345 pounds (5,600 kilograms) fully fueled for launch, spacecraft officials told Spaceflight Now, requiring all the lift capacity of SpaceX’s Falcon 9 booster. That means the launcher’s first stage will be unable to attempt a landing after blasting off with EchoStar 23, and the Falcon 9 is not fitted with the landing legs or grid fins needed for such a maneuver.